We were watching the Golden Globes award show, so while we laughed at awards speeches and commented on the fashion we wanted something light and delicious to eat. We decided on what I like to refer to as a Deconstructed Roasted Tomato Crostini. I emphasize the deconstruction part because instead of piling the ingredients on each slice of toasted bread I served them alongside each other. Serving the ingredients alongside each other not only made it look fresh and beautiful, but it also allowed us to decide how to eat it and what we wanted the ever important cheese-to-tomato-to-bread ratio to be. 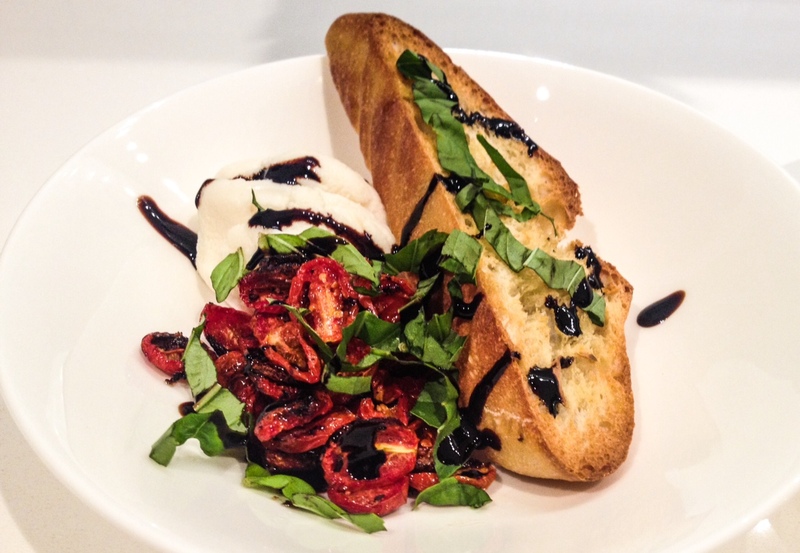 Once plated, I drizzled balsamic glaze and fresh basil to play up the earthy sweetness of the roasted tomatoes. Enjoy! Balsamic Glaze, you could purchase some or make your own – see ingredients and recipe below. Boil in saute pan until bubbles, then reduce heat to low and cook for 20 minutes. Prepare baking sheet with non-stick cooking spray. Toss sliced tomatoes with enough olive oil to lightly coat and add 1/4 tsp salt and pepper. Place tomatoes in a single layer on baking sheet and cook for 40 minutes. After 40 minute increase heat to 400 degrees and bake tomatoes for an additional 15-20 minutes. While tomatoes are baking for the last 10 minutes drizzle olive oil on bread and toast. Once down toasted take garlic clove and rub on each slice of bread. Place 1/4 Cup of Ricotta cheese, 1/2 Cup of Tomatoes, slices of toasted bread on plate and sprinkle with salt, pepper, basil, and balsamic glaze.